No matter how big is a company, it needs an accounting specialist. First of all, for completing all federal, local, and state tax reports. Secondarily, for all billing stuff. Especially, the salary, work time accounting, paying bills, keeping all primary documents in order, etc. There are a lot of other small multiple tasks doing which a bookkeeper feels like a squirrel in a wheel. The best solution for today’s situation is a virtual bookkeeping. It can help to save time and money for any size of business. But let’s start from the very beginning. In bookkeeping all professionals take care to complete all multiple tasks in timely and accurate manner. Any delays or mistakes may affect your business and then no way to escape a number of problems with tax and local authorities. Junior specialists or even remote employees can perform these tasks to keep everything in order. But when a chief accountant takes them on, they become a key employee and the business struggled without their decision making when they are unavailable. Specialists in the business administration say that it is very easy to analyze a company’s structure efficiency. If a business can’t avoid problems or solve them without chief executive officers, for at least a month, then the company’s structure is not sound and there is no rational tasks allocation in the company. In fact, remote employees can complete the majority of routine accounting tasks. Using the various bookkeeping programs available online, remote workers, thus, are freeing the office accounting staff to take on more important tasks. So, what kind of tasks the specialists from a company like frontdeskhelpers.com can do perfectly? In reality, it depends on the industry, but to generalize any of the below tasks can be outsourced with little worry. Data entry: information from primary documents can be entered into special accounting programs. The accuracy will be verified for sure. Intermediate reports and data analysis for ad-hoc purposes. Preparing bills or payments for approval. Keeping track of clients’ invoices and drafting reminder letters. Calculating salary, sick leaves and vacation payments, bonuses and overtime. Controlling delivery of services and decision-making for mitigation of problems. Such situations can occur from non-delivery or wrong goods delivery. Virtually any task which can be handled over the phone or online. The number of advantages you get here is the same as with any remote employee. You save on fixed costs for workspace equipment, salary and taxes, office overhead and all other expenses associated with FTEs. Consequently, you can hire several remote employees for the amount of money necessary for one office worker. In the first example, remote employees allow for an optimal distribution of the workload. As a result, the chief or office accountant is able to take care of more important or confidential things like income, balance or cash flow statements. Moreover, if you have partners from different parts of the world, it is good to have a remote employee residing in that country. It is very useful to have someone who is familiar with business and law environment of that country and is able to give some hints how to deal with this or that situation. 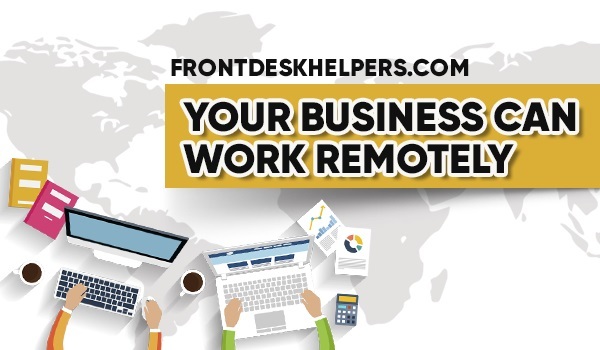 Companies like frontdeskhelpers.com are able to relieve you of the bothers of everyday routine of bookkeeping in an accurate and efficient manner. Hence, our virtual bookkeeping service will ensure your best business performance.